The reason for my mishearing was the quality of her vowel in tour-, which was evidently not one my ear normally expects there. So, using traditional dictionary symbols, we might transcribe Mr Farage’s tourists as /ˈtuːrɪsts/. Another possibility is for CURE words to have the NURSE vowel; this seems particularly common with the words yours and sure, so that surely then becomes a homophone of Shirley /ˈʃɜrli/. I’m not sure if I’ve previously heard Americans using the NURSE pronunciation in tour, tourist or tourism, pronouncing tour- like the first syllable of turkey (and, for many speakers, tournament). I’d be interested to hear from American readers if that’s how they hear the journalist’s tourism above. 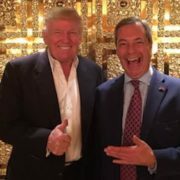 https://www.englishspeechservices.com/wp-content/uploads/2016/11/trump_farage_tweet.jpg 252 484 Geoff Lindsey https://www.englishspeechservices.com/wp-content/uploads/2019/03/blue-mono-logo-small.png Geoff Lindsey2016-11-14 00:01:222016-12-15 17:40:55A convenient day for terrorism? The journalist’s pronunciation is normal American, though she did draw out the ‘r’ longer than usual, so your hearing an extra syllable is understandable; even I, out of context, might write ‘turrerism’ or something. 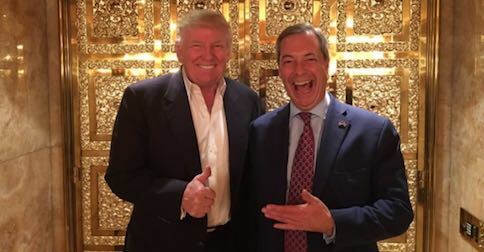 I believe that for Farage’s ‘tourists’ /ʊ:/ would be more accurate than /u:/ – you mention both as possibilities on your page on CURE, with the former being more regular. The full facts: This NURSE vowel is a common American realisation (perhaps the most common) of tourism, tourist, touring – but normally not ‘tour’ itself. ‘Tour’ (and contour) belong to a small group of words mostly perceived as foreign-origin that have retained or acquired GOOSE/CURE; the other common word in America with this vowel is ‘Coors’ beer; I want to call this the TOUR lexical set, though it’s more simply GOOSE+/r/. Since for us the main difference between GOOSE and CURE is syllabicity rather than quality, ‘tour’ normally rhymes with ‘sewer’ here, for the same reason ‘mile’ and ‘trial’ normally rhyme everywhere. On the other hand for tournament, tourney NURSE is the only option; an American spelling reformer might put ‘turnament’, ‘turny’ without hesitation (and he’d be etymologically correct!). There is also, as I just mentioned on the ‘fool in love’ post, a small group (of Wells’s CURE words) that historically acquired FORCE and retain it; for me your/you’re, poor, moor/Moore. NURSE in your(s) is basically a weak form, even if it can be re-stressed. Excepting those two, there is a pervasive tendency toward NURSE merger in American speech, which has become categorical for many speakers (not quite, for me). This means a distinct CURE vowel is no longer required at all. When it is not, as in my careful speech, and ‘pure’ does not rhyme with ‘purr’, it is not likely to rhyme with ‘tour’ either (syllabicity difference again), hence the need for separate CURE and TOUR sets. Failing to distinguish the two, by my observation, is a sign of ‘putting it on’. Even I only ever have NURSE in sure(ly), so there’s a lexical component as could be expected. My penultimate sentence may have been unclear. Here’s a better way of putting it: the TOUR words are varisyllabic, just as you’ve pointed out for various British sets. The CURE words, including ‘poor’ etc. when they aren’t FORCE, are historically and only monosyllabic; so ‘pure’ or ‘poor’ with two syllables is only an affectation from an American (at least in accents I’m familiar with). Thanks as ever for this. With /ˈtuːrɪsts/ I was using traditional phonemic symbols to illustrate Hannisdal’s view that these pre-r monophthongs might just as well be considered GOOSE as a distinct CURE. (Some speakers might differentiate jury － with neither NORTH nor NURSE － from Jewry, but the latter has morphology.) My preferred IPA for non-THOUGHT-NORTH, non-GOOSE pronunciations would be ɵː, with the reservation that barred-o can look too much like schwa. I doubt that NURSE is the most common realisation of tourism. I’ve skimmed the first few dozen of the hundreds of American tourism‘s on Youglish; most are clearly not NURSE, and none sounds to me like the clips I gave of cure and pure. (I have no great faith in the currency of dictionaries, but none of those I have to hand gives NURSE as even an alternative for AmE tourism; I assume you’d consider M-W hopelessly out-of-date for giving ˈtu̇r-nə-mənt as the first pronunciation of tournament.) But I’m happy to accept that NURSE in tourism/t is on the rise. Anyway, though I’m aware of increasing NURSE merger, the journalist’s utterance didn’t at first trigger NURSE in my mind. Perhaps I expect AmE NURSE to be r-coloured throughout, whereas hers is more ‘ɜr’ than ‘ɜ˞’ or ‘ə˞’. I’m not sure whether M-W Learner’s poor /ˈpuɚ/, tour /ˈtuɚ/ are meant to be disyllabic or diphthongal. I take it that you’d consider the rhyming transcriptions to be misleading. I figured what you meant by /’tu:rɪsts/ but it seems improper to transcribe Farage’s ‘tourists’ with GOOSE when it clearly doesn’t have it, and the (different) GOOSE pronunciation really does exist. I called /ʊ:/ ‘more regular’ because, as you have likely considered, it parallels the symbols for the monophthongal SQUARE and NEAR – if they’re basically longer versions of DRESS and KIT, then this CURE vowel is a longer FOOT. I wasn’t worried about the exact symbol, just using /ʊ/ for FOOT as usual. I do not know whether NURSE is really the ‘most common’ realisation, which is why I indicated doubt. Youglish is a great tool, but it is biased toward more formal speech which is what gets captioned. The merger is more likely to be resisted there, especially since tourism and tourist ‘have morphology’, as you put it, though apparently not so strongly as ‘Jewry’. ‘Touring’ does so even more, and I think I’ve only heard NURSE when adjectival. I checked the last claim, too, with Youglish, by listening to 50 ‘American’ instances of poor, pure, and tour. ‘Poor’ is predominantly FORCE, while ‘pure’ seems evenly split between CURE and NURSE. For both, there’s only a few clear disyllables, and only in ’emphatic’ styles where overpronunciation is likely. On the other hand for ‘tour’, neglecting the few FORCE tokens (not GA), the disyllable clearly dominates, and monosyllabic realisations were heard mainly where compression is likely. The split is clear, but non-native speakers are likely to acquire the ‘easier’ [u.ɚ] if it’s not taught, just as they’d end up with [u.ɐ] for non-rhotic English. For AmE as for BrE it is not necessary anymore to teach a distinct CURE, especially if learners can’t produce the native-sounding diphthong and instead break it. You’d correct an SSB learner who pronounced ‘Europe’ with three syllables; I’d similarly prefer a GA learner that consistently said poo-er, pyoo-er, to be corrected. Much better he said pore, pyer, and sound native in that regard. Hannisdal’s point is that (for given speakers) there seems to be no CURE-GOOSE contrast before /r/ (at least morpheme-internally). Therefore the monophthong may be phonemicized as either one. And if a given speaker/accent lacks independent motivation for a distinct CURE vowel, why posit one at all, if it’s only for tokens which may be analyzed as allophones of as GOOSE? An analogous point can be made about my native accent with respect to the NEAR set. My native accent lacks a distinct NEAR phoneme. A word like ‘near’ can be analysed as containing FLEECE plus schwa, /ˈniː.ə/ or /ˈnɪj.ə/, just as ‘fire’ contains PRICE plus schwa, /ˈfaɪ.ə/ or /ˈfaj.ə/. But before /r/, e.g. ‘nearer’, my accent has [ɪː]. The relevant question is: how should this ‘nearer’ be phonemicized? One option is to say it has the pre-/r/ allophone of FLEECE, /ˈniːrə/, since there are no words actually pronounced [ˈniːrə] with which it contrasts. Well, yes, I do understand the point. And it is equally valid, at least if you’re solely constructing the phonemic system of particular speakers. But because transcription normally is used not only for that but also to compare different speakers and different accents, I prefer greater phonetic accuracy. If ‘near’, as you’ve discussed, can be either niːə or nɪː , and we have ‘nearer’ as nɪːɹə , it makes more sense to transcribe its vowel like the _second_ pronunciation of ‘near’, even if the individual speaker never uses it. Americans pronounce as “TURR-iz-m”, never as “TOAR-iz-m”. Most everyone does. I find it hard to believe you’ve never heard an American say it that way. Moor and secure are NOT in the same word set. While we may not say the yod in tour or endure, we “remember” that the word is an underlying long U sound. Long U + R becomes yod+NURSE. Underlying long U + R becomes NURSE. Endure was “in-DYOOR” then “in-DOOR”. However, endure did NOT become “in-DOAR”, it became ” in-DURR”. Words like and became “DOAR” and “MOAR” for Brits and Yanks alike. The in is like the in . For many Americans, we think of them as and . Hence, became “TURR” and not “TOAR”. By the way, Merriam-Webster is not stellar. America has nothing conparable to Longman or Oxford in quality, though Merriam-Webster etc are infinitely better than the pronuniciations and definitions in ” American” dictionaries by British companies. The M-W Learner’s edition is a bungled version of Californian English, but is extremely internally inconsistent. Compare rhotacism notation in diary, fire, fiery, delivery and firing. Americam English is NOT every modern English English merger plus Americanisms. I’ve heard confusion over our cot-caught merger by Brits assuming we also merge court and cot. NORTH and THOUGHT never merged, so it’s not an issue. Wells got his sets wrong. CURE and are separate sets. Likewise GOOSE and “lute” are separate sets. We also never merged DRESS and SQUARE in merry-Mary. We re-syllabified marry as “mair-y” and merry as “mair-y” and Mary stayed “mair-y”. I would recommend ignoring anything Wells wrote on American English. A genius in many rights, but hopelessly lost when it came to US English. It seems gaelsano is trying to say the same thing I did, though less elegantly, and with his browser (?) continually buggering things. ‘Tour’ never had a yod, and I’m not sure who pronounces it ‘turr’ – in my Youglish search I do not recall it. The fact that it doesn’t become ‘turr’ is (part of) the very reason I needed to separate TOUR from CURE. His complaint about cot/court is also slightly off target. Of course _rhotic_ speakers will never merger NORTH and THOUGHT by definition, but many non-rhotic Americans did; however they either kept FORCE separate (New England) or kept LOT separate (everywhere else) – no one has even collapsed all four. The root of the confusion by Brits is, rather, that in America NORTH merged into FORCE and not the other way around as in England; the reason this is not apparent is that _British_ English has then raised the merged vowel to roughly the height of the original FORCE, making American ‘court’ sound to them as like their own ‘court’ plus an R, in spite of the different historical paths they took. This is proved is various ways; but in Ireland where the merger is ongoing, it is in that direction, so Irish linguists would not get it wrong. Unfortunately Wells put his imprimatur on the wrong theory, influenced by the England-centric dictionary tradition. Of course Wells’s Accents of English is RP-centric and his lexical sets aren’t the last word. The fact that I began the section on BrE with a reference to the ‘set’ of RP ʊə words caused gaelsano to burst a blood vessel; I’ve replaced ‘set’ with ‘group’ to prevent further injuries, and I’ve edited his comment to make it more coherent and polite. What I wrote was ‘I’m not sure if I’ve previously heard Americans using the NURSE pronunciation in tour, tourist or tourism’. That was a true statement, and not unreasonable: ‘turr-ism’ doesn’t leap out of Youglish, to which we can add the three North American tourists and one tourism on Forvo. Evidently gaelsano’s notion that ‘most everyone’ says ‘turr-iz-m’ is false; but I’m glad to learn that it’s fairly common. I have been unable to understand the difference in the ‘quality’ of the syllabic r you allude to. I have tried articulating it in various ways, but aren’t sure what the best match is. I would reckon the journalist’s sounds like it is a fricated patatalised buched r, if that’s even possible. As you know there’s much variation in this; I think as long as it’s a continuant, not confusable with any other phoneme, and has at least some rounding, it’s likely to be perceived as a rhotic. There’s no real explanation, I know, why English r came to have this mandatory rounding, shared by no other language as far as I know. It’s one of the distinguishing features of some otherwise-good foreign accents in English, and I imagine equally of English accents in foreign languages. I’m pretty sure that when people talk about the ‘rolled r’ versus the English r, this is what they’re really hearing, but aren’t identifying it using sensible terminology – it’s not ‘rolling’ (trilling) that’s the difference, for an unrounded approximant r in ‘red’ sounds very foreign, while a naturally-trilled but rounded one sounds English (I’ve tried the experiment). You’re right that Wells’s lexical sets aren’t the ‘last word’, but it seems some laymen (at least) think they are, and that’s what gaelsano has encountered (as have I) and gets him upset. The American pattern is no less correct, and probably has no less antiquity, than the conservative RP pattern that makes poor, pure, tour all rhyme. The lexical sets aren’t ‘wrong’ or useless (though I would have made some different choices of which to include), but they are not always used correctly. Geoff – would you please finally fix your god damned pop ups? I had to re-type this entire post (for the zillionth time, and it only happens on your site) because just as I was clicking the mouse after finishing, “Sir Paul’s surprise” popped up, and I could not physically stop my finger in time to avoid losing everything I’d written into the box – this is an atrocious misfeature. (Your last comment wasn’t showing for some reason; I think I’ve fixed it now.) Of course Wells’s Accents of English is RP-centric and his lexical sets aren’t the last word. The fact that I began the section on BrE with a reference to the ‘set’ of RP ʊə words caused gaelsano to burst a blood vessel; I’ve edited that comment to make it more coherent and polite, and I’ve replaced my ‘set’ with ‘group’ to prevent further injuries. What I wrote was ‘I’m not sure if I’ve previously heard Americans using the NURSE pronunciation in tour, tourist or tourism‘. That pretty much remains the case: ‘turr-ism’ doesn’t leap out of Youglish, to which we can add the three North American tourists and one tourism on Forvo. Evidently gaelsano’s notion that ‘most everyone’ says ‘turr-iz-m’ is false; but I’m glad to learn that it occurs. The last two comments here have been duplicated (!) for some reason – but not my subsequent reply of Jan. 10 .